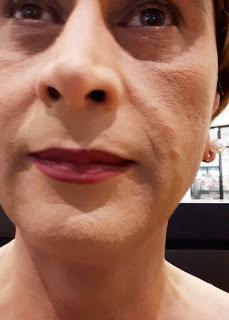 Whereas I used to pack on the makeup in the beard area of the face, I now use a much lighter foundation application thanks to the laser treatments and the Silk'n product I bought. The fact that whatever hair is there is turning white doesn't hurt either. Granted I don't have the skin of a 20 year old any longer, but daily cream applications help to keep it taut and my Mediterranean heritage helps too. As you can see there isn't much difference between the upper and lower part of the face and Patricia has told me that even close up she doesn't see any hint of beard. I can't tell you how important that's been for my confidence as an aging woman.